Apartment in the historical center of Carciano di Stresa, peaceful location, green area. 700 meters from the lake and the beach. Near supermarket that sells local typical products, a restaurant-pizzeria, a bar and a playground. The house has spacious rooms, the bathroom has been completely renovated, balcony equipped for lunch and to relax, windows with a partial view of the lake. There is a garden with a gazebo where you can eat or spend some relaxing moments. The apartments are in the house where we live, in the other ones live also our daughters with their family. I personally did the restructuring of all the whole house some years ago, because I built several villas during my life as work. The whole house was built by my father in law, in the 1943, by a famous architect from Milan, and it is characterized by huge pink granite blocks, unique in their typology. The place is very quiet and the garden is luxuriant, especially in the spring. We are present in the house for all the guest needs during their holiday. My father in law lived in Milan, where he had a sewing firm, he built this house because he loved very much to come to Stresa to spend his holiday, with his family. He was a lake lover, and a very sportsman, so Stresa was the perfect place for him, and not far from Milan. The view is incredible and the tranquillity is the first quality of this place. The apartments are very confortable, in a beautiful place, with all the services: the near supermarket has everythings you need, the beach, the swimmingpool and the cablecar to Mottarone top are at just 5 minutes walking. The apartments are also fully equipted with all the necessary, including Satellite Television, and the rooms are very spacious, with very big windows. Air conditionig is not necessary, because in summer in the apartments there are not too hot. The shower is new and is also very big. In the bathroom there is a washing machine. There are some books about the territory of Stresa, Island Borromeo, vicinity and Lake Maggiore. equipped garden for children and to spend some relaxing moments. There is also a gazebo where people can eat or having breakfast. At Lido which is abut 7 minutes on foot from the house people can take the boat to visit the Island or to go on the other side of the lake. At 30 minutes by car from Casa Belvedere you will find Mottarone: in winter it offers interesting skiing opportunities, in particular for beginners children. You can ski on 20 km of pistes seeing 7 Lakes! The landscape is unique and incredible. When there isn't the snow you can exploring Mottarone by Mountain bike which can be hired in the town, or walking around. There are other famous ski resorts very near, at about one hour by car from Stresa you will find San Domenico, Macugnaga, Domobianca, Alpe Devero, Formazza Ski, 150 km of pistes! Beautiful to visit them also in summer. There are two important Golf Clubs near Stresa: one in Gignese, Alpino Golf Club, 7 km from the apartments, 9 excellent courses, the other in Magognino di Stresa, 5 km distant, Golf Club Des Iles Borromées, 18 courses, which is just a ten minute drive away from Casa Belvedere. Notes on accommodation: The apartments have independent heating. These are a No Smoking accommodations. There is free parking available within 20m from the apartments. Outside: Casa Belvedere A has a balcony where you can stay with two deckchairs and a table, so you can eat on it. Apartment was spacious with renovated bathroom. Nice balcony for two to sit outside and morning sun came in to both living room and bedroom. Good location for activities around the area. Guiseppe & his daughter were very welcoming and the apartment was well equipped. It was well located for the Lido ferries & the cable car. The walk up to the apartment could be quite challenging for anyone with a low level of fitness. It is quite steep in places. we had a lovely stay. The apartment is neat, clean and very well stocked. 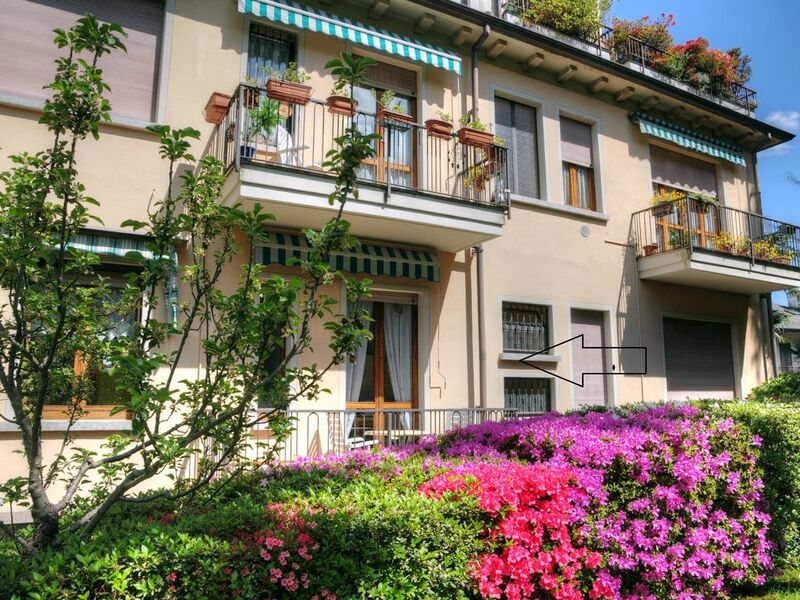 Location is quiet and tucked away in a nice neighborhood about a lovely ten-minute walk away Stresa. An excellent little grocery is a block away and there's a wonderful restaurant right down the street. All in all a very good experience. Giuseppe and his daughter were helpful and attentive. We were picked up at the train station and taken to the apartment. Thank you for your words, we were happy to host you! fantastic apartment..great position near boats and cable car also well stocked supermarket. Fantastic hosts.... would definately come again. Aparment had everything you needed spacious and comfortable. Thank you very much for your words, we'll be happy to host you again! We received a warm welcome with Giuseppe meeting us at the station and driving us on a tour of Stresa. At the end of our stay he also kindly drove us down to the bus stop for the Alibus to Malpensa airport. So we had no need to carry our luggage and we did not hire a car, though, if we had, parking was free nearby. There was an excellent shop 3 minutes' walk away, open every day, serving bread, charcuterie and cheeses, as well as other basic groceries. Five minutes away there was also a friendly restaurant and bar at the Centro Sportivo, La Cascina, where we ate very well. To reach the Lido with access to the boats took us 20 minutes walking( downhill ), whilst a useful bus stop for other lakeside towns, and for Lake Orta was about 15 minutes. So we had easy access to transport and amenities whilst being away from the bustle of Stresa. The entrance hall to the building is elegant, large and secure. The apartment was very spacious, clean and beautifully furnished with everything you could need for a comfortable stay. We used the balcony off the kitchen for our breakfasts and many evening meals. It had a very pleasant outlook over the garden, which was also available to us.. Fiamma joined her father to show us all the tourist information provided and offer advice. Our delightful hosts were available throughout the holiday should we need anything. We really enjoyed our stay in this apartment, it was clean, very well equipped (they also provided us with a cot and highchair) and a good size for our family (two small children). Location is good (decent small shop nearby and a short walk down the hill into town). I'd be very happy to stay there again. At ten minutes walking, or one minute by car, you can reach the Lido or Carciano di Stresa, where there is the equipped beach just in front of Bella Island, a Pizzeria-Restaurant, bar. If you come here you have absolutely to see the Borromean Islands, Isola Bella and Isola Madre with their palace and gardens, and Isola Pescatori, a small village with small streets and typical restaurants that offers dishes with lake fish. Villa Taranto is another beautiful garden in verbania, rechable by boat, in april there are tulips and in summer Dahlie and Ninfee. In Stresa there's also a cable car to reach Mottarone, the mountain with a view on 7 lakes and Monte Rosa chain. Nice walkings and ideal for downhill and bike excursion. Alpinia garden, reachable by cable car, offers a fantastic view on the lake and typical flowers. Lake Orta is also really interesting, 20 minutes by car or 3o minutes by bus. Lake Mergozzo is also ideal to swim. in 1 hour by car you can reach all the famous Ossola's Valleys such as Formazza Valley and Toce Waterfalls, Antigorio Valley, Antrona Valley famous for the lakes, Vigezzo Valley and famous villages like Macugnaga, at the base of Monte Rosa. Lago Maggiore Express is an interesting day trip by train and boat that allows you to see different landscapes and admire the lakes shores from different perspectives. At 30 minutes by car from Casa Belvedere you will find Mottarone: in winter it offers interesting skiing opportunities, in particular for beginners children. You can ski on 20 km of pistes seeing 7 Lakes! The landscape is unique and incredible. You can reach Mottarone with the cable car, only ten minutes on foot from the house. When there isn't snow you can exploring Mottarone by Mountain bike which can be hired in the town, or walking around. There are other famous ski resorts very near, at about one hour by car from Stresa you will find San Domenico, Macugnaga, Domobianca, Alpe Devero, Formazza Ski, 150 km of slopes! Beautiful to visit this mountains also in summer.